BALTIMORE – Big Run Media, a full-service branding, marketing, social media, and creative design agency announced today that it will continue to manage the digital marketing efforts for the 2020 and 2021 The Woodlands Marathon. Held on back to back weekends, The Woodlands Marathon includes a marathon, half marathon, marathon relay, 5k, and 2k fun run/walk. Big Run Media will be responsible for managing the race’s digital marketing throughout the year, including the development and creation of social media campaigns, creative design, and advertisements. Through organic and paid marketing initiatives, Big Run Media was able to attract and capture nearly 2,000 participants for the March 2019 race, resulting in an 8% increase in registration for the marathon and a 9% increase in the half marathon YOY. The Woodlands Marathon Ambassadors, also recruited and managed by Big Run Media, collectively brought in over 550 registrations. The Woodlands Marathon Management, LLC mission is to produce a world-class event while promoting healthy active lifestyles. The Woodlands Marathon has raised and donated over $1.2 million to local, regional, and national nonprofit and volunteer organizations since 2012. 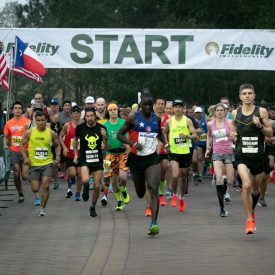 In the inaugural rebirth of The Woodlands Marathon, event organizers developed the “Cheer Challenge”, where community villages, businesses, and organizations support the participants with cheer zones along the marathon and half marathon courses. The Woodlands Marathon Management is an event production company that operates with a primary goal of providing individuals the opportunity to participate in a running event that promotes the advancement of running. The directors of The Woodlands Marathon Management share a passion for The Woodlands community, the Houston region, and the active lifestyle. They have teamed up to produce this premier event that will provide The Woodlands and surrounding communities options for living a healthy lifestyle with purpose. For more information, please visit the event website at http://www.thewoodlandsmarathon.com/.